It is the spring of 1862 and the civil war is at a stalemate in the east. The Confederate army, victorious at Bull Run, sits watching warily across the Potomac. Across the bank, McClellan's 100,000 plus troops train and prepare for the coming campaign. McClellan is being spurred by politicians and press alike to use the army he has molded for some sort of operation. McClellan launches a bold flanking maneuver taking his juggernaut by boat to the tip of the Virginia Peninsula at Fort Monroe. He slowly moves westward towards Richmond forcing Johnston to react and fight or lose Richmond. The battles at Williamsburg, Fair Oaks, Savage Station, Mechanicsville, Gaines Mill, White Oak Swamp and Malvern Hill will forever be seared into the memories of the men that fought there. It is here that the Army of Northern Virginia and the Army of the Potomac will be Forge In The Fire of Battle. 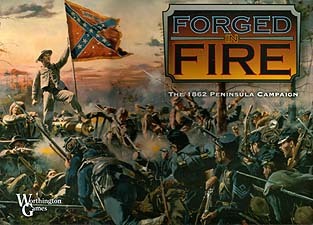 Forged in Fire is a strategic level game covering the American Civil War 1862 Peninsula Campaign at the corps and division level. Command structure is centred around the Corps commanders and their abilities to move the units and fight battles. The game involves strategic elements of maneuver as well as tactical battlefield management. Both Union and Confederate players will be forced to be both offensive and defensive during this ever changing and rapid flowing game. The game includes the complete Peninsula Campaign as well as 3 scenarios: The Union advance from Fort Monroe to the Chickahominy, Johnston's attack at Fair Oaks, and the emergence of Lee during the Seven Days battles. Units include commanders, infantry, cavalry, artillery, siege guns, supply depots, supply trains and the CSS Virginia.